Yep, $300 for a 3-year-old whisky. That’s what Compass Box suggests the price be set at. Nuts right? Actually, the price is just where it needs to be. Obviously, it’s no ordinary 3-year-old whisky. Only 0.4% of this whisky is three years old. The remaining 99.6% is made of whisky MUCH older than that. 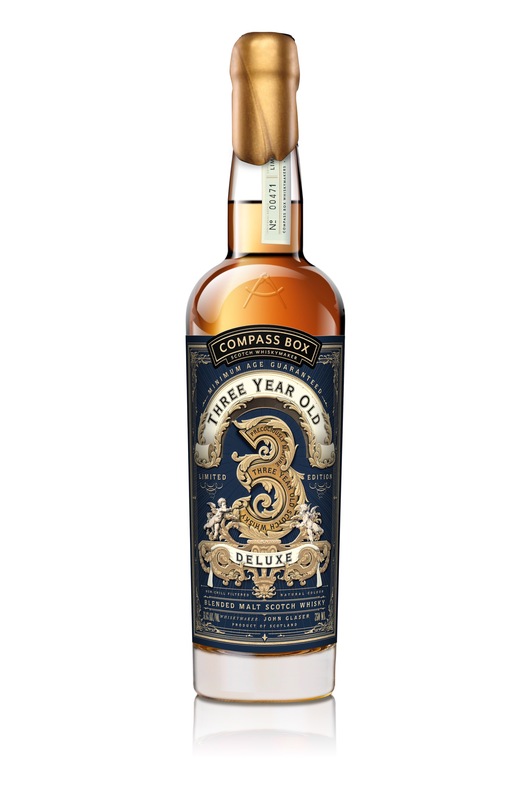 Compass Box’s Three Year Old Deluxe is turning an old whisky regulation on its head – whisky makers can only disclose the youngest component whisky in their blend. Compass Box’s head honcho, John Glaser, wants to tell you what’s in his whisky, and even campaigned to get this law changed. So put simply, ask and you shall receive. I did just that, but I’ve been asked not to publicly release the information. According to an interview I had with Glaser recently, my posting the information could be perceived as promoting, which could prompt a complaint by an Scotch Whisky Association member. Onto the whisky. Three Year Old Deluxe is made of whiskies from “peaty malt whisky distilled on the Isle of Skye” (read: Talisker) and Clynelish, and bottled at 51.6% abv. The aromatic nose features spiced tree fruit, clove, sherried malt and some vanilla bean, along with a hint of white pepper. Taste-wise, the signature waxy fruitiness of Clynelish comes through in a big way. First, there’s a richness and sweetness from the older components. The minuscule amount of 3-year-old Clynelish adds a bit of vibrancy. A bit of clove, vanilla creme brûlée, and spice lead to a whiff of smoke on the back end. The medium-length finish is a touch spicy, sweet and smoky. Thanks to Compass Box for the sample! As always, all thoughts and opinions are my own.